With the shockwaves still ringing around Europe following Cristiano Ronaldo's blockbuster move from Real Madrid to Juventus, the football world will now reflect on the plethora of remarkable and ground-breaking moments with which the Portuguese superstar graced the Bernabeu. Ronaldo's nine-year spell with the Spanish giants was an era defining period of both La Liga and European football, as the mercurial forward truly cemented his status as the world's greatest player. Now set for a new chapter in Turin, a glut of spectacular moments and achievements will come rushing to the memories of all who witnessed Ronaldo wear the famous all-white jersey of Los Blancos with such incomparable distinction. Here is a list of seven of Ronaldo's best moments in a Real Madrid shirt. 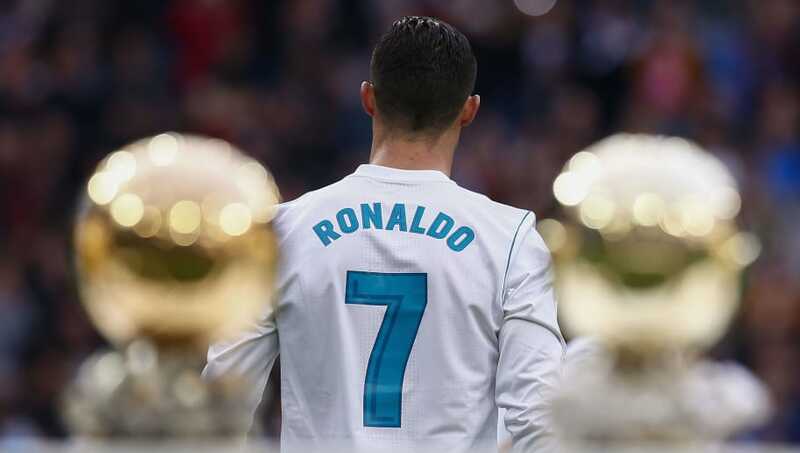 As Cristiano Ronaldo was officially presented as a Real Madrid player to a huge crowd at the Santiago Bernabeu, the football world watched on with unprecedented levels of anticipation and great expectation. Ronaldo's then world-record £80m move to the Spanish capital from Manchester United sparked a new era of Galacticos at Real Madrid, as football's biggest superstar completed what had been a dream move. However great the occasion of Ronaldo's presentation and however large the weight of expectation placed on the player after completing such a huge move, few could have predicted what was to come from the Portuguese superstar for Los Blancos. When Real Madrid drew Manchester United in the last 16 of the Champions League during the 2012/13 season, it was simply written in the stars that former United golden boy Ronaldo would return to the ground where he was still heralded as a hero to strike against his old side. The circumstances were tough and the standings were tight. Madrid travelled to Manchester for the second leg with the tie level at 1-1 following a first leg draw at the Bernabeu, in which Ronaldo had cancelled out Danny Welbeck's away goal. The stage was set at Old Trafford for even greater drama, and Ronaldo didn't disappoint. Though much of the match was overshadowed by the dubious red card for Nani which put United well and truly on the back foot, it was inevitably Ronaldo who stole the show for Madrid. With Luka Modric having again levelled the tie after a Sergio Ramos own goal had given the home side the lead, it was Ronaldo who struck the killer blow to win it for Madrid and send his former employers crashing out in devastating fashion. Ronaldo's lack of celebration made the moment even more iconic. Having been stuck in the shadow of Barcelona and without a La Liga title win throughout the three-year duration of Ronaldo's time in Madrid, Real arrived at the Camp Nou in April 2012 knowing that victory in El Classico would put Los Blancos well on course to secure a first title win since 2008. After Alexis Sanchez had cancelled out a Sami Khedira opener for the hosts, Cristiano Ronaldo was on hand to stamp his mark on the grand occasion in such characteristic fashion. Taking on a superb ball into the danger zone from Mesut Ozil, Ronaldo took one touch before firing the ball past Victor Valdes to seal a dramatic win for his side and set Madrid on course for their long-awaited reclaiming of domestic supremacy over their bitter Catalan rivals. Having become the first ever team to retain the Champions League title in the modern era in the 2016/17 season with a 4-1 triumph in the final over Juventus, following on from a penalty shootout victory over Atletico Madrid in the 2015/16 final, it seemed that Madrid had touched the sky. Remarkably, Los Blancos would go on to eclipse their own remarkable achievements to seal a third successive European triumph in Kiev as Real Madrid beat Liverpool 3-1 to seal a hat-trick of Champions League successes in three consecutive years and an unprecedented period of dominance over European football. 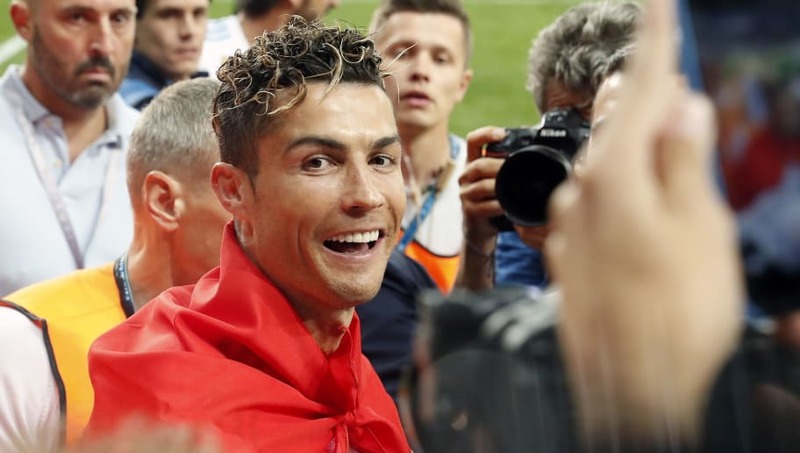 Though Ronaldo failed to get on the score sheet in the showpiece even in Kiev, the Portuguese was typically the spearhead and leading man for his side en route to the final, finishing as the competition's top scorer with 15 goals, five ahead of his nearest rivals. 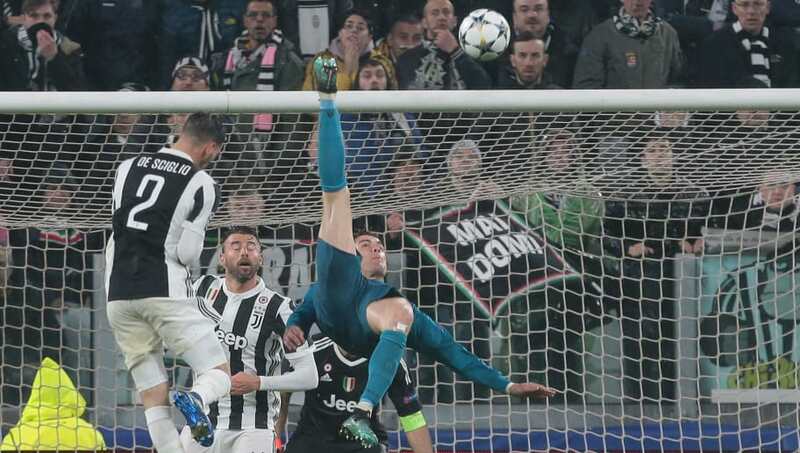 The most iconic and spectacular strike of Ronaldo's 15 Champions League goals on course to Madrid's third consecutive European triumph last season came in the form of a stunning overhead kick goal away to Juventus, the club which Ronaldo will now be joining just three months on. The super strike came in the first leg of Madrid's quarter-final win over Juventus as Zinedine Zidane oversaw a 3-0 win for his side in Turin against another of his former clubs, but it was Ronaldo who stepped up to overshadow the subplot involving his legendary French manager. A goal which defined the stardom of Ronaldo in a single moment and encapsulated the sheer audacity and brilliance through which the Portuguese striker has become a global phenomenon, it was a goal which imprinted Ronaldo's name firmly in another European triumph for Madrid. 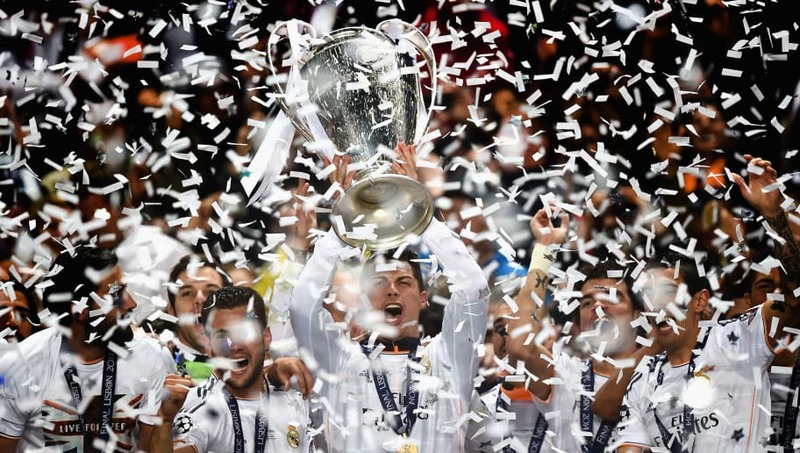 As Real Madrid stepped into the 2014 Champions League final against local rivals Atletico Madrid, the stage had never been better set to seal Los Blancos' dream triumph. Fittingly for star man Ronaldo, the final was even held on home soil in Lisbon. Surely enough, the Portuguese superstar stood and delivered to guide his side to the silverware which they had long craved. A stunning late Sergio Ramos equaliser forced the match into extra time at 1-1, before Ronaldo assumed control and stole the show, firing in a penalty to seal Real's 4-1 win and cement his place in Madrid folklore. With a real sense of a seizing of control and dominance over European football, it was Ronaldo who once again reaped the individual rewards as he was handed a second consecutive Ballon d'Or award in 2017, once again ahead of Barcelona rival Lionel Messi. It was the latest addition to another chapter in the long-running Real Madrid vs Barcelona, Cristiano Ronaldo vs Lionel Messi narrative which has dominated La Liga and European football for almost a decade. With Ronaldo's move to Juventus finally bringing one of the greatest sporting rivalries to an end, at least in terms of his direct competition with Messi as the leaders of Spain's two premium superclubs, it is clear that Ronaldo had the final victory, having been crowned World Player of the Year for each of the last two seasons ahead of Messi. 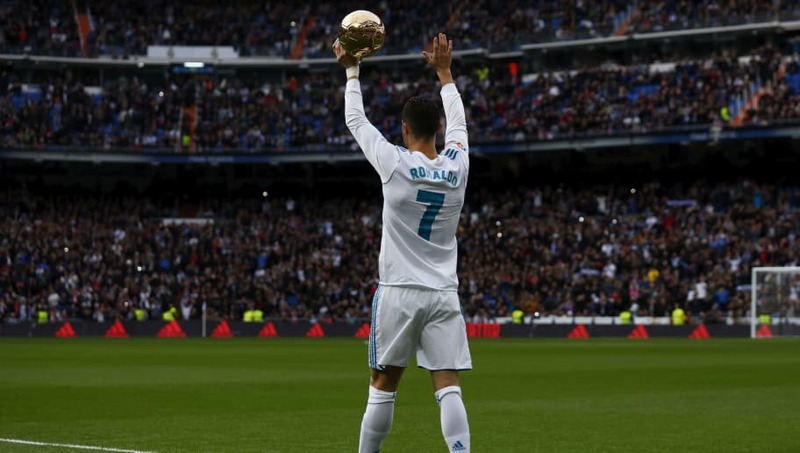 Ronaldo paraded his latest accolade in front of the adoring Madrid crowd in a Bernabeu celebration of their modern idol and the superstar of their all-conquering generation. It was a fitting way to bring the curtain down on a spectacular individual contribution to Europe's biggest club.